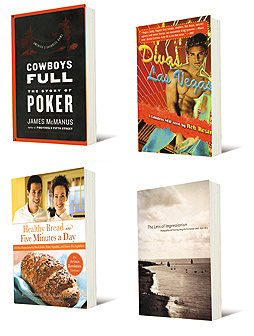 In My Little Chickadee, Mae West asks, “Poker—isn’t that a game of chance?” and W.C. Fields reassures her, “No, my dear, not the way I play it.” If this strikes a deep chord within, immediately pick up a copy of James McManus’s Cowboys Full. The title refers to a full house poker hand, three kings over any other pair. The author of Positively Fifth Street (2003) returns with this sizeable, comprehensive tome packed in a readable 516 pages. The first chapter: “Pokerticians.” The first sentence: “Poker skill didn’t vault Barack Obama into the presidency.” The reader is drawn in from there. Game theory, strategies military and recreational—all are found in poker play. John von Neumann’s monumental Theory of Games and Economic Behavior (1946—coauthor Oskar Morgenstern) derived in part from a slender pamphlet penned back in 1928 titled On the Theory of Parlor Games. McManus’s excellent book is rich, discursive, anecdotal, delving into psychology and the will to win. To what lengths would you go to retrieve your Grandma’s hideous discarded vase, now resurfaced on a Las Vegas Antiques Roadshow, and worth in the five figures? Because our hero, Em (not his real name, a detail you’ll learn later) just has lost his job, but gained a suitcase full of moola (later), the obvious answer is “Vegas.” Em and best friend Justin, gay, fey, and twice as horny as Em, jet off to Sin City to find the vase’s new owner; buy it back; indulge in men, gambling, pharmaceuticals, more men; and return home. Because the tale, narrated by Em, opens with him locked in a closet full of Bibles and choir robes, clad only in his Armani silk briefs, we intuit that some teensy cog or two has slipped in foolproof Plan A. Read it yourself. It would take me the same 287 pages to explain as it does Rosen to recount, with none of his panache. The success of the original Artisan Bread in Five Minutes a Day revealed that regular folks were willing to take up baking for pleasure and health, and to make a habit of providing the freshest and best for their households. With Healthy Bread in Five Minutes a Day, authors Hertzberg and François are upping the ante, offering 100 even healthier methods of creating one of mankind’s earliest civilized foods. With health-conscious bread eaters clamoring for new and varied techniques, chapters like “Breads with Hidden Fruits and Vegetables” and “Gluten-Free Breads and Pastries” allow them to be inventive. Along with recipes for enticing and easily made breads, the reader is given an understanding of the interactions of the ingredients—salt, water, varieties of flour—that clarify in an entertaining and informative, rather than pedantic, tone. Start off with Healthy Bread’s Master Recipe, letting your imagination waft you away on clouds of freshly baked delights. All in only five minutes a day. As a feast of images, Lens of Impressionism superbly reproduces the work of some of the greatest masters in painting and photography from 1860 to 1874, among them painters Gustave Courbet, Edgar Degas, Edouard Manet, and Claude Monet, plus, perhaps less known to us, but as seminal, pioneering photographers Louis-Alphonse Davanne, Gustave Le Gray, and Henri Le Secq. Themes emerging through the essays of internationally recognized scholars—such as Sylvie Aubenas, Bibliothèque Nationale de France; Dominique de Font-Réaulx, Musée du Louvre; and Carole McNamara, University of Michigan Museum of Art Senior Curator of Western Art—are the symbiotic relationships among artists, photographers, and the Normandy coast itself. This convergence of place, techniques, and emerging technology transformed the artistic media, and shaped commercial ventures, tourist travel, regional and national cultural expressions as well. The impact on “the new painting” (Impressionism) becomes evident here.